How to make tiny ribbon bows using a dinner fork and narrow ribbon. Weave these pretty little ribbon bows on an ordinary dinner fork. You can make lots of them fairly quickly, so this is a good option if you’re dressing up a batch of bazaar crafts, or need some tiny bows for a group craft project. The technique is also a good one to remember when you are wrapping small gifts; one or two ribbon bows might be all you need for that extra bit of pizzaz. They also make great embellishments for homemade greeting cards or scrapbooking. 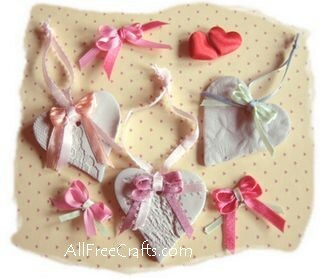 When I was making these to decorate some Clay Valentine Hearts I found them very easy to make and rather addictive; once you get going, you’ll want to make more! 1. Begin weaving a length of narrow ribbon between the tines of a dinner fork, as shown in the photo tutorials at right. 2. Continue weaving the ribbon through the tines of the fork, until you have completed five rows. Make sure that the ribbon weaves under a tine on one row, and over it on the next row, so that the rows look like those shown here. Cut the ribbon, leaving a tail end on the right hand side, this being the same length as the tail that you left on the first row. 3. Slide the woven rows up the tines a little bit, leaving a small gap at the bottom. Now take another piece of narrow ribbon (this can be in the same color as the first ribbon, or a contrasting color) and slide one end under the woven strips, in between the middle tines, as shown. Slide the other end of the new ribbon between the middle tines at the top of the fork. Cross over the two ends of the new ribbon and pass one end under the other end, beginning an overhand knot. 4. Pull the knot tight, bringing all the rows of woven ribbon together. Make make another overhand knot over the first one to secure. Slide the bow off the fork. Pinch the middle of the bow between your thumb and index finger and adjust the four tails of the bow to your liking. I found that with a little pulling here and there, I could bring the tails down and align them consistently.